Hi Asod, all my best wishes for 2013 and a lot of nice daily sketches ! In 40 years, I have already seen approximately twenty comets, LINEAR remains modest, but for me, this is the prettiest small one I observed. To make this sketch I watched more than 12 nights with 1 to 2 hours per night to see and draw it. At year-end 2012, we had to wait early in the morning, because of the position and to avoid moon light. After the new-year passage it was more comfortable, the comet was walking near the zenith. I evaluated the best magnitude end 2012 to 8.0 + / – 0.3. Today Jan 05 she fades out to 10 +/- 0.5. Thanks to my friend’s astronomers in the region, I observed in four refractors, 80/480, 127/820, 102/1000, 140/1120 and two telescopes 114/500, 250/1000. The comet was always relatively easy to catch with a wide field eyepiece, 40mm or 25mm. The observation sites were distributed; we could compare the sky quality of Rocbaron, Rians, Flassans and Néoules. What is interesting in the sequence is to see that near January 2nd the comet passed from one side of the ecliptic to the other, so 1 and 2 January’s tail and coma were not really separated. At the beginning of the sequence the comet follows her tail; Jan. 2 tail was behind the coma, aligned with us on earth. After that the comet flies before her tail. It’s a bit like a small cat playing with its tail. Time is given in UT. Thanks for taking the time to look at my sketch and a lot of clear skies to you all for 2013 ! Michel Beautifully rendered and displayed with the little historic fov mini sketches, just wonderful. what a great work. 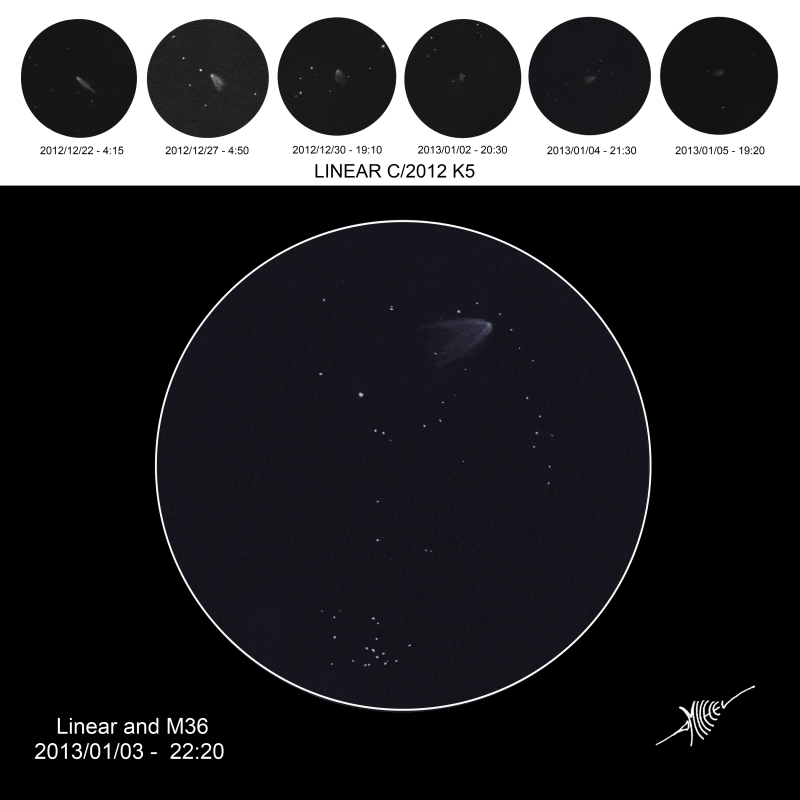 Your sketches of the comet sights over the last two month are very interesting. It´s impressive to see the changing tail. I think we all hope, that in 2013 the big comet C/2012 S1 (ISON) can be observed as a century event. Excellent sketching! You did closely follow this one closely this winter.